Mageplaza Product Alerts for Magento 2 is an excellent solution to keep in touch with customers and update them with every change in product availability and price changes. This is a great bridge to maintain the relationship with customers, improve shopping experience, express good customer care service, and especially contribute to increasing conversion rates. With a retail shopper, he can be updated with the coming back of his favorite item via his email as soon as possible instead of visiting the store many times to track the visibility. With the wholesales, they can be notified quickly the back-in-stock items, so they can be active with their business plan and promotions. It is definite that potential customers receive notification when products come back in stock and they will process purchasing right after. As a result, stores will earn money shortly after some minutes their products re-appear in the market. Letting customers know that they will be notified about the coming back of their preferred items is a good way to calm down customers’ disappointment. Besides, this is the ideal way to keep in touch with customers and express the good care towards customers. Because customers can be notified right when there is any fluctuation in price, they can reach the affordable or good price quickly. Then, they will be excited to pick their favorite items with satisfaction. The lower price is significantly beneficial to the wholesales as they always order a large number of units per item. When a store implements sales campaigns with discounts on product price, price-change alerts will work as an effective announcement tool to reach potential customers as soon as possible. Depending on the statistic of notification requests, admins can easily find out which products are being favored by customers and at which price the items seem the most attractive to shoppers. “Notify me” button As a way to calm down the customers’ worry or disappointment when their concerned items are out of stock. 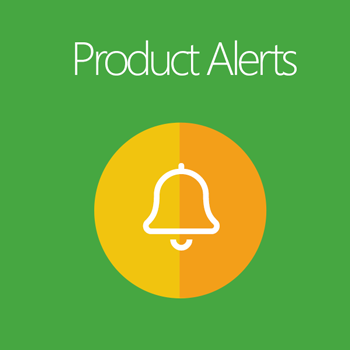 The first noticeable feature of Product Alerts is the function of Out-Of-Stock Alerts. When customers get the notice that the preferred product is sold out, immediately they will pay attention to the “Notify me!” button below the image. Here a sounding pop-up will appear to ask whether customers would like to subscribe for notification email when their concerned products come back in stock soon. Congratulations notice for successful subscription When customers have subscribed successfully, there will be a congratulation notice appearing. Customers will remember that they will get emails when their favoured items come back in stock. Enable price alerts for specific products It is admitted that price be highly concerned by customers when they involve shopping at any stores. “I want this product but the price now is too high for me” or “I wish the better price of this lovely item which I can afford it” - this kind of customers’ sharing is quite common on the daily basis. Display pop-up subscribe box Product Alerts allows showing a popup suggesting customers for subscribing newsletter for price change. With customers who are highly concerned about specific products with the hope for the better price, this function is really significant to them. Product Alerts allows sending notifications on restocked products and/or items with price change via customers’ emails easily. With store owners, the module supports both type of sending action: auto-email by running cron every 1 hour or manual-email by editing from backend subscriber lists. Meanwhile, customers do not have to actively track the news on the store sites. This helps both sides save a deal of time, make the info - exchange process much more effective and professional. Besides, the automated and up-to-date emails will enhance customers’ experience significantly. There is no limitation related to setting alerts with product types. With just one click, admins can quickly enable Back In Stock Notification and/or Price Alert to any products. Besides, the requester list for each product is also updated and displayed right on editing section of the products for the easy quick view. This is the valuable statistic data which assists store owners to assess and analyze customers‘ interest and behavior about which the most favorable products are and at which price customers are attracted most. Hence, stores can adjust and take the next steps of drawing up business strategies wisely and effectively. From the admin backend, it is easy to select customer groups where non-login customers are also included. This will bring the convenience for the newcomers who have the first visit to stores. It is easy for customers to raise requirements for price alerts or out-of-stock notifications while it is not required for login action. This will save time for customers and improve the user experience. View, add requests for stock and price change subsription from the backend grids easily. Select customer groups visible to product alert information. Set frequency, start time to run product alerts. Send notification email about errors of sending product alerts. Add email recipient, email sender, email template when errors occur.